Fear is a powerful thing. It can drive us, or make us alert. Or it can wrap its icy fingers around our heart and turn us to stone. It can beat it our brains and chant Run, run, run. Or it can curl around our minds like a snake and hiss, Don’t move, don’t move, don’t move. Either way, there is always something we fear. I was up when the sun peeked above the mountains that morning, the sky shot through with magenta. According to the weather app on my phone, today was supposed to be glorious. I wanted to spend the entire day outside, starting with a pleasant walk at sunrise. Running my fingers through my short brown hair, I searched my room for my favorite hoodie. It was gray, lined with fleece, and had a big pocket to stuff my hands into. I found it under a pile of dirty jeans and tugged it over my head. I hurried into the kitchen, where I grabbed a notepad and pen. I scribbled a quick note to my mom: Going for a walk. Be back soon. Love you, Reese. I stuck it to the coffee pot, where Mom would be sure to see it. With a banana in hand, I slipped silently out the back door. The cold air hit my face with a rush. I shivered in delight as marched through the back yard. My face was turning pink and numb by the time I reached the edge of the woods. Our property was bordered by a wild, overgrown forest. Wolves howled from it at night, owls hooted from their branches, and some said it was haunted. And I absolutely loved it. The soft bed of pine needles beneath my feet, the twittering birds flitting through the trees, the burbling brook; all these things and more were reasons to love the forest. I strolled through the woods, breathing in the smell of the pine trees and honeysuckle. This place made me feel content. And there were always new wonders to marvel at each time I visited it: bright blue eggs in a robin’s nest; tiny red tea berries dotting the ground; a doe and her fawn bounding through the underbrush. As I meandered down the well-worn path, which I’d walked upon so many times, I heard a low growl off to my left. My feet rooted themselves to the ground. I hardly dared to breathe. No snarling, starving beast jumped out of the surrounding bushes. I finally allowed myself to take a breath. It was probably nothing. A stray dog or something. Nevertheless, I was curious. I wanted to investigate. Some part of me didn’t believe the stray dog idea. Like an idiot, I pushed aside some clingy briars and ventured off the familiar path. After several minutes of walking, I hadn’t found anything. No paw prints, no broken sticks, no fresh animal droppings. I was just about ready to find my way back to the path when I stumbled into a clearing. Tiny periwinkle-blue flowers covered the clearing. Six tall, leafless tree inhabited the space. Two in a straight line on the left; three, also lined up, on the right; and one in the middle. Something was off about this serene clearing. Maybe it was the fact that the grass seemed duller, or that the birds had ceased their singing, or that a shadow had concealed the still-rising sun. My chest tightened. Something was definitely wrong. I could feel it in my gut. I was desperate to leave, to run away as quickly as I could. But, against my will, my legs drew me forward, toward the six trees. I came to a halt in front of the first tree on the left. Something was scratched into the bark. I ran my fingers over the groove. It appeared to have been made using a knife, or maybe a claw. It formed a letter: B.
I peeked at the tree directly behind the one with B carved on it. Scraped into the trunk of the second one was the letter E.
My eyes flicked over the four remaining tree. Letters were cut into them, too. 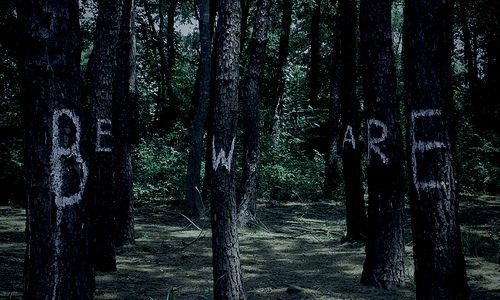 B . . . E . . . W . . . A . . . R . . . E . . .
“BEWARE,” I whispered to myself, stunned and terrified. Suddenly, a bloodcurdling, guttural scream erupted form the forest. A hulking, shadowy object charged through the bushes surrounding the clearing. I turned on my heel and ran, my heart trying to bust out of my chest. Blindly, I tripped over roots and my own feet as I made a mad dash for the path. Once I’d found it, I sprinted back toward my house, faster than I’d ever run before. I lept onto the porch and slammed through the door, locking it behind me. Normally, I would object to be called “baby.” I was nearly sixteen, after all. But this was a special case. I leaned into my mother’s hug without a word. “Reese?” Mom’s voice was quivering. “What’s wrong?” she repeated. I buried my head into her shoulder, starting to cry. I didn’t know how to tell her about what I’d seen. In fact, I didn’t even know what I’d seen. All I knew was that I was terrified of it. “Reese –” Mom sighed. “Did something scare you?” When I still didn’t reply, she gave up on talking and began to stroke my hair comfortingly. We all fear something. I fear that creature in the woods. But I have choice, because F-E-A-R means two things.